At the recent loss of her mother, Roxanna Rowan sets out into the 1779 frontier to Kentucky to surprise her father. She gets there to find he has been killed in the line of duty and she suddenly is a 29 year old orphan with nowhere to go. She settles into frontier life helping in the kitchen, despite her status. She becomes the scrivener for Colonel McLinn, taking over where her father had left off until spring allows her to move on. Feeling very spinster-like after her recent un-engagement, she has no desire to fall in love again. God has other plans for her as she starts to feel for Colonel McLinn. Not only warring against the redcoats but against the native Indians, Colonel McLinn and his team are great danger. Roxanna finds her father’s old journel and reveals to Colonel McLinn that her father sensed a spy among them. 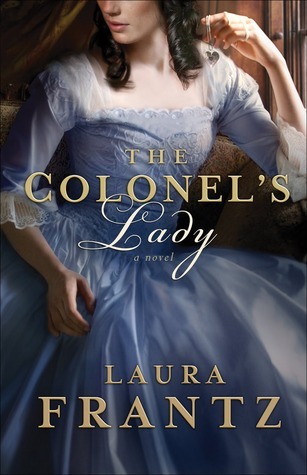 Laura Frantz has created deep and emotional characters that you root for throughout the novel. Her ability to put into words and descriptions the places and circumstances provides the reader with a blast back in time. It was so easy to get lost in the pages and feel as if I were seeing the story in my mind. Being able to visually create the scene for the reader is a gift, and even more so from a historical perspective. A beautiful story of a heroine, her hero, and the enemies that surround them, all the while focusing on the love of God and his providence. Melanie, Thanks so much for taking time for Roxanna's story and for posting a beautiful review! I feel blessed!